I love listening to lecture demonstrations by the Carnatic musicians. As I have never learnt Carnatic music, a lot of what they say goes over my head. But the little I understand gives me a bit more to appreciate the music better. When some subtle nuances in a song are explained well, it improves my appreciation of the song the next time I listen to it. R.K. Shriramkumar’s lectures are my favorite because of his content and delivery. But when I listen to a lot of others, I feel frustrated because of various reasons. A general lack of preparation, not having a structure, having too much content that cannot be done justice in the given time, struggling to find the audio clips that they want to share, letting the audio clips run for much longer than needed, discussing with fellow presenters on stage as to what to sing, unnecessary personal anecdotes… the list is endless. A recent lecture by the renowned Mrudangam player Manoj Siva was a pleasant surprise. Manoj delivered a lecture titled 'MrudangAunrAgam' on ‘A Deeper Understanding of the Art of Mrudangam Accompaniment’. I was very impressed with the preparation that had gone in to this lecture. The right amount of content for a two hour lecture and he had even decided which line of a composition needs to be sung to highlight a particular point he was making. There were no struggles with the laptop in playing the clips and there was hardly any personal anecdote. The lecture is meant for listeners and he has managed to keep it at that level despite going through a variety of topics. He rightly concludes the best accompaniment is one that complements the singer and does not draw the focus on the accompaniment itself. Manoj, being the soft spoken man that he is, would have been helped with a wearable mic as at times I was not able to hear him as he moved around in the stage. And I would have also preferred an unedited version of the video, as the editing interrupts the flow. Manoj was helped by Ashwath Narayanan, Shriramkumar Rk and BS Purushotham in this presentation. Thank you Manoj, for the lecture and for sharing it in public domain. Keep those lectures coming. I have been reading and discussing with others on the on going #MeToo revelations and rebuttals over the last week or so. In particular I have been surprised by the names that are being called out in the Carnatic music fraternity. Other than being a listener, I have no exposure to this world and hence my reaction may be naive and that had kept me from voicing my opinions though I have been sharing the views of others that I thought were healthy and sane. I read a couple of posts today that I felt, should be discussed in a larger forum and the nature of these posts made me rethink my stand of just observing. The first and the second of these were from Sri. V.V.Sundaram. I only know him by name and as a great supporter of Carnatic music in the US and the main man behind the Cleveland Aradhana. The first was his post about a representation a group of young musicians had made to the Aradhana Committee. This seems to be a continuation of a statement a much larger group of young musicians made earlier expressing their views on the current events. To me, it was an earnest request, in private, from a group of youngsters to a respected team of elders to consider a situation they are not comfortable with. It starts with their expressing confidence on the festival and then goes on to how their confidence is shaken because of the current events and requesting the committee for some specific steps. But the reaction from Mr. Sundaram is shocking to say the least. (https://www.facebook.com/669340249/posts/10156498319445250/) It is so patronizing and plays on the emotions rather than realizing the concerns of the young musicians and providing them the much needed confidence. His first paragraph is about the impact of the festival, which the musicians do agree and applaud. The second is about his personal connections to the musicians. No one is questioning his integrity or his relationship with the young musicians. Why does he feel as if his integrity is questioned when a larger request is not about him at all? How did a request to elders gets repainted as something that is all about Mr. Sundaram, the work he has done, the relationship his wife and he has with musicians, conveniently forgetting the misdeeds and those who have suffered? This letter or the concerns expressed, are not about you Sir. He then goes on to question thus - "If they had any concerns about the festival, today or in the past, they could have come to me, or any member of the committee through the same open door through which they have come for so many other personal and professional reasons. Instead, for some reason, they opted to take collective action, with a hostile tone, describing the Festival as "decidedly unsafe" in a letter directed to the Committee”. Does he not realize the musicians have come to him and the committee precisely for the same reasons? If just one person had an issue he or she would have come alone, there is a general feeling of discomfort, so they all have chosen to write together. I don't see how this is a problem. And the last thing I can say about that missive from the musicians is, that it is hostile. They have been respectful, appreciative and at the same time expressing their discomfort and requesting action to make them feel comfortable. Mr. Sundaram goes on to list various initiatives of his, which are all good causes. I dont have any reason to doubt them at all. Except for one thing where he calls Nagaswaram artists as those from depressed community! Then comes a bombshell. "Two years ago, when credible evidence of sexual molestation through first hand testimony was brought to our notice, we disinvited 4 musicians from the festival – although all 4 had warm personal relationship with the Aradhana Committee.” You have had a lawyer drawn up code of conduct for the last seven years. But when molestation happens, all you do is disinvite the artists! And to date we dont know who they are and we might be interacting with them and may be even send our kids to them for lessons. Thank you for that Mr. Sundaram. That definitely makes me feel unsafe. And no wonder the kids who wrote to you feel unsafe too. Now that you have said that there were four people who misbehaved, can you name them in public so that we know who they are and keep away from them? And ensure that our children are not around them alone? Since you had credible evidence, did you share that information with other organizations in the US so that they are aware of the situation and would act based on the information? Did you even consider it was your duty to do that? Many a times, these artists stay in the houses of individuals during their travel in the US. Since you did not make this public, do you realize that you have put women and children at risk? You managed to disinvite them, but how many other households would have invited them? Did you not think of this? Your code of conduct says "We take all allegations of misconduct very seriously and will undertake a thorough review and/or refer the matter to an independent legal authority or law enforcement.” You had allegations, you had credible proof and yet you decided not to refer the matter to law enforcement or inform immigration authorities about this misconduct. Now that you have made this public, would this not reflect badly on your organization? Unlike how you have taken this to be, the letter does not make you personally responsible for you to feel hurt. It only reiterates the trust the musicians have in you and hence they have chosen to write to you to correct the current situation. I wish you had taken up on yourself to do exactly that rather than make sentimental statements. But I have some questions for you. Given that despite a code of conduct, you did nothing but disinvite artists against whom you had credible evidence of molestation and you had no word of sympathy or support for those who have been abused but could sympathize with one of the accused why cannot someone feel unsafe around you? I want to bring to your attention how some others have reacted. And just to bring a different dimension to how you see this issue and how a young musician see it, it is imperative that we all read this wonderful response from Rajna Swaminathan. It takes a lot of courage to write this article and I am glad that she has done it. I am happy to say that I have interacted with this brave person and am proud to be an acquaintance of hers. Great Lakes Aradhana Committee, Detroit, has also come out with a statement supporting #MeToo movement and on their zero tolerance policy. They have also featured singer Chinmayi, who is playing a key role in the MeToo movement, in an upcoming program of theirs. Kudos. For long such exploitations have been brushed under the carpet and the perpetrators have gone scot free. This is a chance to set things right. This is a chance to create an eco system that would protect the young and also provide a channel to assist them when something bad happens. This is the time to make changes and you can do it, Sir. So, Mr. Sundaram, I urge you to step back and relook at what has happened. This is not a time to take affront or be sentimental. I hope you do consider the open letter to be a plea for help rather than an accusation against you. This is NOT about you. I hope you stand with us all in empathizing with the victims and in condemning anyone who has stooped down to commit such atrocities. I hope you call out those four people against whom you have credible evidence so that we can be sure we know whom not to take chances with. I hope, at least in future you do more than just disinvite such criminals and involve law enforcement and immigration. And more importantly, I hope you recognize the discomfort of the young musicians and do all that you can to assuage their concerns and keep up the good work of promoting Carnatic music and young American talents for a long long time. I saw this comment from one Lakshminarasimhan Ranganathan. It does not deserve a link but I will attach this screenshot. This man needs medical help and I am willing to sponsor all his visits to a good psychiatrist. I hope and pray he gets well soon. சமீபத்தில் நியூஜெர்ஸியில் நடந்த கச்சேரியில் பாடகர் டிஎம் கிருஷ்ணா அவர்கள், எழுத்தாளர் பெருமாள் முருகன் அவர்கள் எழுதிய பாடல் ஒன்றை ரீதிகௌளை ராகத்தில் பாடினார். சுவாரசியம் அப்பாடலின் பாடுபொருள். பொதுவாக கர்நாடக இசையில் பெரும்பாலும் பக்தி சார்ந்த பாடல்களே பாடப்பெறும். மிகக் குறைவான அளவில் ஜாவளி போன்ற வடிவங்களில் காதற் பாட்டுகள் இடம் பெறும். அல்லது கச்சேரியின் இறுதிப் பகுதியில் பாரதியார் பாடல்கள் போன்ற நாட்டுப்பற்று பாடல்கள் இடம் பெறும். இவ்வகையில் இல்லாத பாடல்கள் மிகவும் அரிதே. இந்தக் கச்சேரியில் பாடிய பாடல் ஒரு பறவையைப் பற்றிய பாடல். அதுவும் பொதுவாக அதிகம் பேசப்படாத ஆந்தையைப் பற்றிய பாடல். ஆந்தையும் கண்கள் பற்றியும் அதன் அலறல் பற்றியும் அழகாக எழுதப்பட்ட இந்தப்பாடலை பாடிக் கேட்கும் பொழுது அத்தனை அற்புதமாக இருக்கிறது. உடன் வாசிக்கும் கலைஞர்கள் ஶ்ரீராம்குமாரும், அருண்பிரகாஷும் இப்பாடலின் தன்மையை உணர்ந்து வெகு அழகாக வாசித்தனர். குறிப்பாக இருளின் தன்மையைக் கொண்டு வர மிருதங்கத்தில் ஒரு பக்கம் மட்டும் கொண்டு அருண்பிரகாஷ் வாசித்த இடங்களைப் பற்றிச் சொல்லியே ஆக வேண்டும். இந்தப் பாடலுக்கு மெட்டமைத்தவர் டிஎம் கிருஷ்ணா. ஆந்தை மட்டுமல்லாது மேலும் சில பறவைகள் மேல் பாடல் புனைந்திருப்பதாக பெருமாள் முருகனிடம் பேசிக் கொண்டிருக்கும் பொழுது சொன்னார். அவையும் விரைவில் மேடை ஏறும் என எதிர்பார்க்கிறேன். தற்பொழுது பாடப்படும் பாடு பொருளினால் கர்நாடக இசையினுள் வரத் தயக்கம் கொண்டோரை உள்ளே இழுக்க இது அற்புதமான வழி. தொடர்ந்து பல கலைஞர்களும் இது போன்ற பாடல்களைப் பாட முன் வர வேண்டும். இப்பாடலின் தனித்தன்மையை உணர்ந்து இதனை எல்லாரும் கேட்க வகை செய்த CMANA இயக்கத்தினருக்கு என் நன்றி. ரிக்‌ஷா ஒன்றினை ஒரு இளம்பெண் ஓட்டுவது போலவும் அதில் அந்த ரிக்‌ஷாவினை பொதுவாக ஓட்டும் தொழிலாளி அமர்ந்திருப்பது போலவும் ஒரு புகைப்படைத்தை நீங்கள் பார்த்திருக்கலாம். அந்தப் பெண் இந்த ரிக்‌ஷாக்காரரின் பெண் என்றும் இஆப பணிக்குத் தேர்ந்தெடுக்கப்பட்ட சந்தோஷத்தை தன் தந்தையை அமர வைத்து இப்பெண் இழுத்துச் சென்று கொண்டாடியதாகவும் வாட்ஸப்பில் ஒரு கதை சுற்றி வந்தது. அது வழக்கம் போலப் பொய் என்றும் இது ஒரு விளம்பரத்திற்காக எடுக்கப்பட்ட புகைப்படம் எனச் சொல்லி நல்ல கதையை இல்லாமல் செய்த நல்ல உள்ளங்களுக்கு என் கண்டனங்கள். இன்றைக்கு ட்விட்டரில் இது தொடர்பாக ஒரு நண்பர் கேட்ட கேள்வி - ரிக்‌ஷா என்றால் என்ன? ட்விட்டரிலேயே சிறுபதில் தந்துவிட்டாலும் இதைப் பற்றி விரிவாக எழுத வேண்டும் என்று நினைக்கிறேன். முதலில் ஒன்றைச் சொல்லிவிடுகிறேன். சக மனிதனைக் கால்நடைபோல் கருதி ஒரு மனிதனை மனிதன் வண்டியில் இழுத்துச் செல்வது என்பது தமிழர் பண்பாடு கிடையாது என்பது நான் சொல்லித் தெரிய வேண்டியது இல்லை. வேண்டாத பல பழக்கங்கள் வெளியில் இருந்து வந்து நம் பண்பாட்டைக் குலைத்ததுபோல் இந்தப் பழக்கமும் நடுவிலே சில காலம் நம்மிடையே இருந்தது ஒரு துன்பியல் சம்பவமே. நல்லவேளை நம்மை நாமே மீட்டுக் கொண்டோம். போகட்டும். ஷா என்றால் மன்னர்கள், அரசர்கள், பேரரசர்கள். இன்றைய ஈரான், அன்றைய பெர்ஷியாவில் பயன்பட்ட சொல் என்றாலும் இதற்கு மூலம் வடமொழியில் இருக்கும் க்ஷத்ர என்ற சொல்தான். அதே வேர்ச்சொல்லில் இருந்து வந்த க்ஷத்திரிய என்ற சொல் வீரர்களைக் குறிக்கப் பயன்படுவதாக விக்கிப்பீடியா சொல்கிறது. (1) ஆக ஷா என்ற வடமொழிச்சொல் வட இந்தியாவில் மன்னர்களைக் குறிக்கப் பயன்பட்ட சொல் என்பது நிரூபணமாகிறது. வேதங்களில் பழமையானது ரிக் வேதம் (2). பத்தாயிரத்திற்கும் மேற்பட்ட பாடல்களை பத்து மண்டலங்களாகக் கொண்ட ரிக் வேதத்திற்கு நான்கு வேதங்களில் என்றுமே முதன்மையான இடம் உண்டு. இந்த ரிக் வேதத்தைக் கற்றுணர்ந்து அதனைப் பின்பற்றுபவர்களுக்கு ரிக்வேதிகள் என்று பெயர். இவர்களில் முதன்மையானவர், ரிக்வேதிகள் அனைவருக்கும் தலைவராகக் கருதப்படுபவரை ரிக்வேதிகளின் மன்னர், ரிக் வேதத்தில் மன்னர் என்ற பொருள் வரும்படி ரிக்‌ஷா என்று அழைப்பார்கள். மிகவும் ஞானம் உள்ளவராகக் கருதப்படும் இவரை அக்காலச் சமூகம் போற்றிக் கொண்டாடும். அவர் வெளியே செல்லும் பொழுது அவரின் வண்டியை இழுத்துச் செல்வது பெரும்பாக்கியமாகக் கருதப்பட்டு அதில் மாடுகளோ குதிரைகளோ பொருத்தப்படாமல் அவரின் சீடர்களே அவ்வண்டியை இழுத்துச் செல்வது வழக்கம். ரிக்‌ஷா வரும் நேரம் என்ன? ரிக்‌ஷா வந்தாகிவிட்டதா? என்றெல்லாம் மக்கள் பேசியதால் காலப்போக்கில் ரிக்‌ஷா என்பது ரிக்வேதிகளின் தலைவரைக் குறிப்பது போய், மனிதரால் இழுக்கப்படும் அவ்வண்டிக்கான பொதுப்பெயராகிவிட்டது. ரிக்வேதிகளின் தலைவருக்கு மட்டும் இப்படிப்பட்ட மரியாதையா என எண்ணிய மற்ற வேதங்கள் ஓதுபவர்களின் தலைவர்கள் தமக்கு இது போல வண்டி வேண்டும் என மரியாதையைக் கேட்டு வாங்க ஆரம்பித்தார்கள். நாள்போக்கில் யாரிடமெல்லாம் அந்தஸ்தும் பணமும் அதிகாரமும் இருக்கிறதோ அவர்கள் எல்லாருமே இவ்வண்டிகளைப் பயன்படுத்தத் தொடங்கினர். ஆனால் வண்டியின் பெயர் மட்டும் அதன் மூல காரணமாக இருந்த ரிக்வேதிகளின் தலைவரின் நினைவாக ரிக்‌ஷா என்றே நிலைத்துவிட்டது. தானே ஒரு ரிக்‌ஷா ஓட்டுநராய் நடித்த பொழுது, இந்த ரிக்‌ஷா ஓட்டுநர்களின் சிரமம் அறிந்த புரட்சித் தலைவர் அவர்களுக்கு மழைக்கவசம் தந்து மகிழ்வித்தது நம் நாட்டின் வரலாறு. கொடுத்து சிவந்த கரங்கள் கொண்ட தெய்வம் அவர் என்பதற்குச் சான்றல்லவா இது. இயந்திரம் பொருத்திய வண்டி பின் தானி என மாறி இன்று நம் மாநிலத்தில் இப்படி கால்நடை போல மனிதன் நடத்தப்படும் அவலம் இல்லாமல் போய்விட்டது. நம் நாட்டின் பெரும்பாலான பகுதிகளில் இவ்வண்டி கிடையாது. ஆனால் தொழிலாளிகளின் நலனுக்காகப் போராடும் இடதுசாரிகளின் கோட்டையான மேற்குவங்கத்தில் மட்டுமே இவர்கள் இன்னும் இருப்பது ஒரு நகைமுரணே. All of us have experienced many a memorable meal. Most often, they are memorable because of the inclusion of a dish we had not experienced before or because one dish in that meal was exceptional. It is rare that a meal becomes memorable because the courses were just right and the overall experience was perfect without any single dish dominating the palate. The Austin concert of Ramakrishnan Murthy was one such. Ramakrishnan Murthy is one of the leaders of the youth brigade of carnatic music, all of whom show tremendous potential and artistry. Although based out of Chennai these days, he was brought up in California and so his current tour in the US is more of a home coming. He sang in Austin on May 11th in a program organized by India Fine Arts and was accompanied by the talented Charumathi Raghuraman on the violin and the experienced mridangist Manoj Siva. Ram started the concert with the brisk Chalamela varnam in Shankarabharanam. After wishing the moms in the crowd a very happy mother’s day weekend, he sang Kanchadalayadakshi in Kamala Manohari (Ram mentioned the Ragam as Manohari though) and followed it with Marivere in Ananda Bhairavi. I was expecting the concert to continue with a Devi flavor but he chose to present Manavyaala in Nalinakanti next. The main piece of the concert was a glorious rendition of Kaapaali in Mohanam. The ragam, delivered in an unhurried sedate fashion and crisp swaram singing were the highlights. My in laws, who are Mylapore natives, were super thrilled with the choice of the krithi and mentioned they longed to have a darshan of Kaapaali. And as though he heard their comment, Ram launched a moving Mukhari beseeching Shiva’s kindness by asking Endraikku Shiva Krupai Varumo, an apt choice to follow that majestic Mohanam. The second half of the concert featured the Purandaradasa song Entha Cheluvage. A wistful viruttam, a song by Thaayumaanavar — Pannen Unakkana Poosai was next. Ram effortlessly moved through Behag, Dhanyasi, Begada, Kaapi, Atana, Nilambari and Bowli before concluding it in Sindhu Bhairavi and singing Visweshwar Darshan Kar in that ragam. He concluded the concert with the thiruppughaz Maalasai Kopam in Jonpuri and a Kamas thillana. Charumathi Raghuraman provided excellent support following Ram through the concert and showcasing her skill when it was her turn to play. There were delectable exchange of ideas between them throughout the concert and the chemistry between them was obvious. I always admire Manoj Siva for his sensitive playing of the mridangam and it was at the forefront in this concert as well. His understanding of the krithis reflected in the way he played throughout the evening. The thaniavarthanam he played was short and delectable. To me the best part of the concert was the serene music that the team provided. There was no unnecessary fireworks, no adrenalin inducing ups and downs. It was simple, genuine music of the highest quality. I wish Ram continues in this fashion and I am sure he will reach the pinnacle in his profession soon. Even after the best of meals, we always will have a comment on what could have been better and here is my list. For us, away from India, the opportunity to hear artists of this caliber is quite limited. A two and a half hour concert does not sate us and we wish if it could be for an hour more, at the least. That would have given time for a Ragam Thanam Pallavi, which was the only missing item in this otherwise perfect concert. Ram, now that he has the guidance of RK Shriramkumar, should include a couple of rarer krithis in such concerts rather than sticking with ever popular krithis. Also, an addition of a upa pakka vadhyam would have brought in another rhythmic dimension and the organizers would do well to make that a standard practice. Overall it was a very satisfying evening. I thank Ram, Charumathi and Manoj for their music and the organizers for bring them to Austin. Should T.M.Krishna be stoned for blasphemy? The event was the release of the Telugu version of TJS George’s book on M.S.Subbalakshmi. And T.M.Krishna was invited to speak on Culture and Community in that event. The event was reported in Deccan Chronicle and it has created a storm. The report had attributed certain quotes to TMK which was felt as unsavory by a cross section of the Carnatic Music fraternity spanning both artists and listeners. There were many articles, highly critical of TMK, published as reactions to the report. Being familiar with the way mainstream media works, I decided not to express my views on this issue till I had a chance to hear the speech myself. I finally did come across the video of the full speech and after having heard it, I think that the unnamed reporter has performed as he is expected to, stringing a bunch of juicy quotes and presenting them without any context, to draw the reader’s attention. When reading that report, it is natural for the reader’s eyebrows to go up. Mine did too. But don’t we all know how a newspaper report is written? Why was there such a hurry to condemn even without giving the man a chance to defend himself? If interested in going further, I request you to watch the video of the full speech, including the Q&A sessions first. Let me reiterate that I don’t agree with all that he has said. I do have my differences of opinion on various issues with him. I have debated them with him in public and in private. And on certain points we have decided to agree on disagreeing. But has he committed blasphemy as some critics claim? I don’t think so. On the contrary I think he has nothing but the highest regards for her. I have come off with the feeling that he has inherent respect for the music of MSS and for the persona herself. He clearly quips that she has become Saraswati and without a pause also puts forth a question as to why should she have to become one? He observes that over a period of time, her music has become more curated, choreographed and set up but despite that she was able to deliver divine music, that stirs and shakes. The transformation in her music might be observed by some as getting more classical and Bhakti oriented. But to him, it sounds like the earlier ebullience has been lost and a tinge of sorrow has been added. He is quick enough to say that he is hypothesizing here. I don’t see any disrespect here. Another big point in the report that ruffled a lot of feathers was that he asked the audience if they would have adored and liked her songs if she was dark skinned and dressed differently. The single line in the newspaper did sound odd. But the context was totally different. The remark was not about MSS at all. He was giving out his hypothesis that the audience to which she catered was reaffirming its own identity through the looks, the intonation and the emotions that MSS was creating for them and that if the same music had come from someone who did not fit their profile, the impact would not have been the same. The reason being that the associations that gave the audience the feeling of comfort would not be complete. The questioning was about the recipients not the giver. He goes on to say why great cultures question themselves, how they remove the barriers between the insiders and the outsiders and how when he raises these questions, he is questioning himself too. An interesting point here was how he was explaining why just keeping the doors open is not enough and an outreach has to be made to make this music more inclusive. Today, I came across a report of a concert of Ranjani Gayathri hosted in the Vadapalani Metro Station, the first time I am seeing such a program that was not arranged by TMK. I think that is a positive step. The other interesting observation I had was that the Carnatic music fraternity, which normally does not express opinions on controversial subjects openly was pretty vocal in this case. This, in my opinion, is a welcome change. There were many who wrote articles condemning TMK for the alleged views. I have one simple question. You all believed a news paper report and were upset enough to pen your articles but why did not even one of you reach out to your own colleague and ask if he had indeed made those statements? Would that have not been a fair treatment of one of your own? I am sure that this has not happened when I read all those rejoinders. Some weeks before, I had come across a Facebook post, which chronicled a speech on the life of MSS. The article was all in praise of how the speaker handled difficult to digest subjects such as how Sadasivam managed MSS with an iron hand or about her father or her alleged romance with GNB or the near dictatorship of Sadasivam as parodied by RK Narayan. But that friend of mine also went along with this newspaper report and was quite critical of TMK for saying how MSS’s music was choreographed. I find this hypocrisy hard to digest. I have not read the book by TJS George on MSS and if the excerpts that I have read are any indication it is not likely to be a well rounded biography. But I would not want to commit the same crime as others and pass judgment on a book I have not read. I will try and read the book sooner than later and then make up my mind. But if there were one authentic biography which is well researched, well balanced and not hagiographic, it would have been the go to reference on her life. There are historians who write today about the life of Benjamin Franklin after a great deal of research. Why can’t such an effort be taken for chronicling the life of the Queen of Carnatic music? To me it is a failure of the Carnatic music community for not having ensured that. As TMK says in his speech, good art has the ability to break pattern, do to us things that we don’t like. I guess some artists do that too. கம்பன் தனது படைப்புக்கு வைத்த பெயர் ராமாவதாரம். ஆனால் வடமொழியில் வால்மீகி எழுதிய ராமாயணத்தைத் தழுவி எழுதப்பட்ட நூல் என்பதால் இது கம்பராமாயணம் என்றே அழைக்கப்படுகிறது. அயணம் என்றால் வழி. ஒரு மனிதன் எப்படி தன்னை விட உயர்ந்தவர்களைப் பணிந்து, வரும் கஷ்டங்களை எதிர்கொண்டு, தீமைகளை எதிர்த்துப் போராடி, நட்புகளைப் பேணி, மனித நேயத்துடன் நடந்து, நல்லதொரு மனிதனாக எப்படி வாழ வேண்டும் என ராமன் வாழ்ந்து காட்டிய வழி ராம அயணம். ராமனை அடையும் வழி ராமாயணம் என்றும் சொல்லலாம். கம்பராமாயணத்தைப் படிக்கத் தொடங்கினால் அதில் முதல் பாடலாக இருக்கும் கடவுள் வாழ்த்திலேயே மயங்கிப் போய்விடுவோம். அத்தனை அழகான தொடக்கம் அந்தக் காவியத்திற்கு. எழுதத் தொடங்கும் பொழுது கடவுள் வாழ்த்துடன் எழுதத் தொடங்குவது மரபு. நாம் (இப்பொழுது இல்லையானாலும் சிறு வயதிலாவது) பிள்ளையார் சுழியுடந்தானே எதையுமே எழுதத் தொடங்குகிறோம். கடவுளை வாழ்த்துவது நம் மரபு. வாழ்த்துவது என்றால் நம் மரியாதையைச் சொல்வது. இன்று வாழ்த்த வயதில்லை வணங்குகிறோம் என்று யாரேனும் சொன்னாலோ எழுதினாலோ வாழ்த்து என்பதன் பொருளே தெரியாமல் வாழ்கிறார்களே என்பதே எனக்குத் தோன்றும் எண்ணம். போகட்டும். எழுதுவது ராமனின் கதை. அப்படி இருக்கும் பொழுது அவன் புகழைப் பாடித் தொடங்குவதுதானே இயல்பு? ஆனால் கம்பன் தனது காவியத்தைத் எப்படித் தொடங்கி இருக்கிறான்? இதைப் பிரித்து எழுதினால் நமக்கு நேரடியாகவே புரியும். அதுதான் கம்பராமாயணத்தின் அழகு. பொதுவாக மங்கலமொழி கொண்டு தொடங்க வேண்டும் என்ற மரபினை தழுவி உலகம் என்ற சொல்லோடு ஆரம்பிக்கிறது இந்தக் காவியம். உலகங்கள் அத்தனையும் தானே படைத்து, காத்து, அழித்தலுமாய் தொடர்ந்து நடந்து கொண்டிருக்கும் முடிவில்லாத விளையாட்டினைக் கொண்ட தலைவனான கடவுளிடம் நாங்கள் சரண் அடைகிறோம். எழுதுவது ராமாயணமாகவே இருந்தாலும் ராமனின் பெயரைச் சொல்லாமல், ராமனாக அவதரித்த திருமாலின் பெயரைச் சொல்லாமல், வேறு எந்தக் கடவுளின் பெயரும் இல்லாமல் பொதுவான ஒரு தலைவனின் புகழ் பாடும்படியாக அமைந்திருப்பதே இந்த வாழ்த்தின் சிறப்பு. நீர், நிலம், நெருப்பு, காற்று, ஆகாயம் என்ற பஞ்சபூதங்களால் ஆனது இந்த உலகம். நாம் இருக்கும் உலகம் ஒன்று. அப்படி இருக்கையில் உலகம் யாவையும் என ஏன் எழுத வேண்டும்? உலகம் ஒன்றினைத் தானுளவாக்கலும் என ஏன் எழுதவில்லை? ஏன் என்றால் இந்த உலகம் மட்டும் உலகம் வேறு உலகங்கள் இல்லை எனக் கம்பன் நம்பவில்லை. அவதாரங்களைப் பற்றிப் பேசும் பொழுது வாமன அவதாரத்தில் மூவுலகையும் இரண்டு அடிகளில் ஆட்கொண்டான் எனச் சொல்கிறோம். கிருஷ்ணாவதாரத்தில் மண்ணைத் தின்று தாயிடம் தன் வாயைத் திறந்து ஏழு உலகங்களைக் காண்பித்ததை ‘வையம் ஏழும் கண்டாள் பிள்ளை வாயுளே’ எனப் பெரியாழ்வார் சொல்கிறார். இதே ராமாயணத்தில் பின்னால் ஓர் இடத்தில் ராமன் தன்தம்பியைப் பார்த்து “இலக்குவ உலகம் ஓர் ஏழும் ஏழும் நீ கலக்குவென்” எனச் சொல்வதாகக் கம்பனே எழுதுகிறான். அதாவது பதினான்கு லோகங்கள் இருப்பதாக ராமன் சொல்வதாக இருக்கிறது அந்தப் பாடல். இப்படிப் பல உலகங்கள் இருப்பதாகக் குறிப்பிடுவதால் அதனை இத்தனைதான் எனச் சொல்லாமல் தெரிந்தும் தெரியாமலும் இருக்கும் உலகங்கள் அத்தனையும் உன் படைப்பே என்பதை உலகம் யாவையும் எனச் சொல்கிறான் கம்பன். உலகங்கள் யாவையும் உருவாக்கி, காத்து, அழித்தலுமான விளையாட்டைச் செய்கின்ற தலைவன் என அழைத்து தன் வாழ்த்தைச் சொல்கின்றான். இவை அனைத்தையும் செய்கின்ற தலைவன் ஒருவனே. இவை அனைத்தும் அவன் ஒருவன் செயல்களே என்று தெளிவாகக் குறிப்பிடுகிறான். இவற்றை மிகவும் எளிதாகச் செய்வதைச் சொல்லும்படியாக அவை அந்தத் தலைவனுக்கு இது வெறும் விளையாட்டே என்றும் சொல்கிறான். தொடர்ந்து செய்யப்படுவதால் இதை முடிவே இல்லாத அளவிட முடியாத அலகிலா விளையாட்டு என்றும் சொல்கிறான். கடைசியாக, கடவுள் வாழ்த்து என்றாலும் அதில் வாழ்த்துகிறேன் எனச் சொல்லவில்லை, வணங்குகிறேன் எனச் சொல்லவில்லை, சரண் அடைகிறேன் என்று சொல்கின்றான். ஏனென்றால் ராமாயணத்தில் தொடர்ந்து சொல்லப்படும் ஒரு தத்துவம் என்னவென்றால் அது சரணாகதித் தத்துவம்தான். இலக்குவனும் அனுமனும் தங்களை ராமனுக்கு அர்ப்பணித்தது போல் வேறு எவரும் செய்தது கிடையாது. சுக்ரீவன் சரண் அடைந்தான், விபீடணன் சரணாகதி அடைந்தான். இப்படி இந்தக் காவியம் முழுதுமே சரணாகதித் தத்துவத்தைச் சொல்வதாக அமைந்துள்ளது. இவை அனைத்தும் வரப்போகிறது என்பதை கோடி காட்டவே முதல் பாடலான கடவுள் வாழ்த்திலும் கூட சரண் எனச் சொல்லி கோடி காட்டி ஆரம்பிக்கிறான் கம்பன். இப்படி ஒவ்வொரு சொல்லும் அத்தனை பொருத்தமாக எடுத்தாண்டு இருப்பதால்தான் இணையே இல்லாத கவிஞன், கவிச்சக்ரவர்த்தி கம்பன் என்று இன்றும் அழைக்கப்படுகிறான். விஞ்ஞானத்தை வளர்க்கப் போறேண்டி மேநாட்டாரை விருந்துக்கழைச்சு காட்டப் போறேண்டி எனப் பாடினார் கலைவாணர் என்.எஸ்.கிருஷ்ணன். விஞ்ஞானத்தைப் வெறும் புத்தகங்களைக் கொண்டோ அல்லது பாட விளக்கங்கள் போலவோ பேசினால் கேட்பவர்கள் சுவாரசியமற்றுப் போவார்கள். செயல்முறை விளக்கமாகவோ அல்லது விருந்து படைத்து அதன் மூலம் விஞ்ஞானத்தைப் போதித்தால் அது எளிதில் உள்வாங்கப்படும் என்று அவர் நினைத்தாரா தெரியாது ஆனால் அதுவே இப்பொழுது உண்மை எனக் கொள்ளப்படுகிறது. நான் சிறுவயதில் அருங்காட்சியகத்திற்குச் சென்றால் காட்சிப்பொருட்களுக்கு முன் “தொடாதீர்கள்!” எனக் கொட்டை எழுத்துகளில் எழுதப்பட்டிருக்கும் அறிவிப்புகள்தான் நம்மைப் பயமுறுத்தும். ஆனால் இன்று தொட்டு விளையாடி அனுபவபூர்வமாக உணர்ந்து கொள்ளத்தக்க வைகையிலேயே அருங்காட்சியகங்கள் அமைக்கப்படுகின்றன. குறிப்பாக ஆஸ்டினில் நான் சென்று வந்த சில இடங்களைப் பற்றிய அறிமுகமே இக்கட்டுரை. முதலாவதாக “Thinkery” என அழைக்கப்படும் குழந்தைகளுக்கான அருங்காட்சியகம். ஏன் என்ற கேள்வி இங்கு கேட்காமல் வாழ்க்கை இல்லை என்று புரட்சித்தலைவர் பாடியதுக்கேற்ப குழந்தைகளை ஏன்? எப்படி? எதற்காக? என கேள்விகளைக் கேட்க வைப்பதே தங்கள் குறிக்கோள் எனக் கொண்டு இயங்குகிறார்கள். ஆஸ்டின் குழந்தைகள் அருங்காட்சியகமாக 1983ஆம் தொடங்கப்பட்டு 2013ஆம் ஆண்டி Thinkery எனப்பெயர் மாற்றம் பெற்று 40,000 சதுர அடிகள் கொண்ட சொந்தக் கட்டிடத்தில் இயங்குகின்றது இந்த அருங்காட்சியகம். எல்லா வயது குழந்தைகளுக்கும், மனத்தில் குழந்தைகளாக உள்ள பெரியவர்களுக்கும் மிகுந்த உற்சாகத்தை அளிக்கக் கூடிய பல காட்சிப்பொருட்களைக் கொண்டுள்ளது Thinkery. சிறு விமானங்களைச் செய்து பறக்கவிடுவது முதற்கொண்டு நம் குசினியில் இருக்கும் பொருட்களைக் கொண்டு செய்யக்கூடிய பரிசோதனைகள் வரை பலவற்றையும் கற்றுக்கொள்ள ஏற்ற இடமாக இருக்கிறது. காட்சிகள் மாறிக்கொண்டே இருப்பதால் பலமுறை செல்லக்கூடியதாக இருக்கிறது இந்த இடம். குழந்தைகளை அறிவியலில் ஆர்வம் கொள்ளச் செய்வதற்குக் கட்டாயம் இங்கே கூட்டிக் கொண்டு செல்லுங்கள். அடுத்ததாக கொஞ்சம் வயது வந்த குழந்தைகளுக்கும் பெரியவர்களுக்குமான ஒரு நிகழவு. Astronomy on Tap (AOTATX) என்ற பெயரில் ஆஸ்டினில் உள்ள டெக்ஸாஸ் பல்கலைக்கழகத்தின் வானவியல் துறையினர் மாதம் ஒரு மாலை North Door என்ற இடத்தில் நடத்தும் நிகழ்வு இது. பொதுவாக மாதத்தின் மூன்றாம் செவ்வாய்க்கிழமை இந்த நிகழ்வு நடைபெறுகிறது. வானவியல் பற்றிய ஆர்வம் இருந்தால் போதும் அதைப் பற்றி அதிகம் அறிந்திருக்காவிட்டாலும் பரவாயில்லை, அனைவரும் புரிந்து கொள்ளத்தக்க வகையில் இந்த நிகழ்ச்சி இருக்கிறது. ஒவ்வொரு நிகழ்விலும் மூன்று பேராசியர்கள் ஆளுக்கொரு தலைப்பில் மிகவும் எளிமையாகப் பேசுவார்கள். நகைச்சுவை கலந்த பேச்சுனூடே நமக்கு நல்ல விஞ்ஞானத்தையும் கடத்திவிடுகிறார்கள் இப்பேராசிரியர்கள். இப்பேச்சுகளோடு அந்த மாதம் இடம் பெற்ற சுவையான நிகழ்வுகள், சிறு பரிசுகளைக் கொண்ட போட்டி என மிகவும் சுவையாக நடத்தப்படுகிறது இந்நிகழ்வு. வயதுவந்தோர் பியரோ வைனோ அருந்தி கொண்டே பேச்சுகளை கவனிக்கலாம். உணவிற்கு ஒரு சிறு டெக்ஸ்மெக்ஸ் உணவகமும் உள்ளே இருக்கின்றது. இதே இடத்தில் Nerd Nite, Not So Math, Sh!t Faced Shakespeare என வானவியல் மட்டுமல்லாது வேறு சில நிகழ்வுகளும் நடைபெறுகின்றன. வெறும் பேச்சுக் கச்சேரிதானா? வேறு ஒன்றும் கிடையாதா என்பவர்கள் Austin Astronomical Society நடத்தும் பொதுமக்களுக்கான நட்சத்திர இரவில் பங்கேற்கலாம். இவர்கள் மாதம் ஒரு முறை டெக்ஸாஸ் பல்கலைக்கழகத்தில் வானவியலில் பல்வேறு தலைப்புகளில் பேசுவது மட்டுமின்றி இங்கிருந்து சுமார் 40 மைல் தொலைவில் இருக்கும் Canyon of the Eagles என்ற இடத்தில் பெரிய தொலைநோக்கிகள் மூலம் நட்சத்திரக் கூட்டங்களையும், கோள்களையும் பார்க்க வசதி செய்து தருகிறார்கள். செயற்கை வெளிச்சம் அறவும் இல்லாத Designated Dark Sky Site என்பதால் நாம் சாதாரணமாகப் பார்க்கக் கிடைக்கும் நட்சத்திரங்களை விட பல மடங்கு நட்சத்திரங்களை அங்கு காண முடியும். அங்கத்தினராகச் சேர்ந்தால் மேலும் பல நிகழ்ச்சிகளுக்கும் அனுமதி உண்டு. அது மட்டுமில்லாமல் பள்ளிகளிலோ அல்லது வேலை செய்யும் நிறுவனங்களிலோ ஒரு மாலைப் பொழுதில் தொலைநோக்கிகளுடன் வந்து விளக்கம் தரும் நிகழ்ச்சிகளையும் செய்து தருகிறார்கள். பல கோடி வருடங்கள் பயணித்து நம்மை வந்தடையும் நட்சத்திர ஒளியின் கீழ் ஓர் இரவைக் கடப்பது என்பது அற்புதமான ஒரு அனுபவம். கட்டாயம் முயன்று பாருங்கள். ஆஸ்டினில் இப்படி இன்னும் பல நிகழ்வுகள் நடந்து கொண்டு இருக்கின்றன. நம் மனத்தில் எழும் பல கேள்விகளுக்கு விடைகளை அறிந்து கொள்ள ஒரு வாய்ப்பாக மட்டுமில்லாமல் இளைய தலைமுறையை விஞ்ஞானத்தில் ஆர்வம் கொள்ளச் செய்யவும் இவை பெரும் வாய்ப்புகளே. இவற்றை நாம் நல்லவிதத்தில் பயன்படுத்திக் கொள்ளவேண்டும். Time, time, time See what’s become of me… starts the famous song “A Hazy Shade of Winter”. What really is time though? Some time last year I met with a car accident. An iron rod fell from the back of a truck in front of me and hit my car. I could clearly see the rod falling from the truck, the car moving to a side as I tried to evade it and eventually feeling the rod hit the back tire. The whole incident would have lasted a couple of seconds at the most, but to me it was as if it happened in slow motion. I could very clearly see every step of what had happened then. Did time slow down really for me? During the summer of 2000, I had been to Iceland for work. We landed late at night and I went to sleep immediately. I woke up to a bright and sunny morning and panicked that I was late for work. When I got ready and went downstairs I realized it was just 3AM. The very next day, I woke up and saw the sun shining. I told myself that it would be early morning and didnt get out of the bed, till I got a call from my boss asking if I am going to turn up to work. It was 10Am. It was as if my body clock went cuckoo, because of the unfamiliar stimuli from the sun which never set and because of the jet lag from the travel across time zones. So what makes the body clock tick? 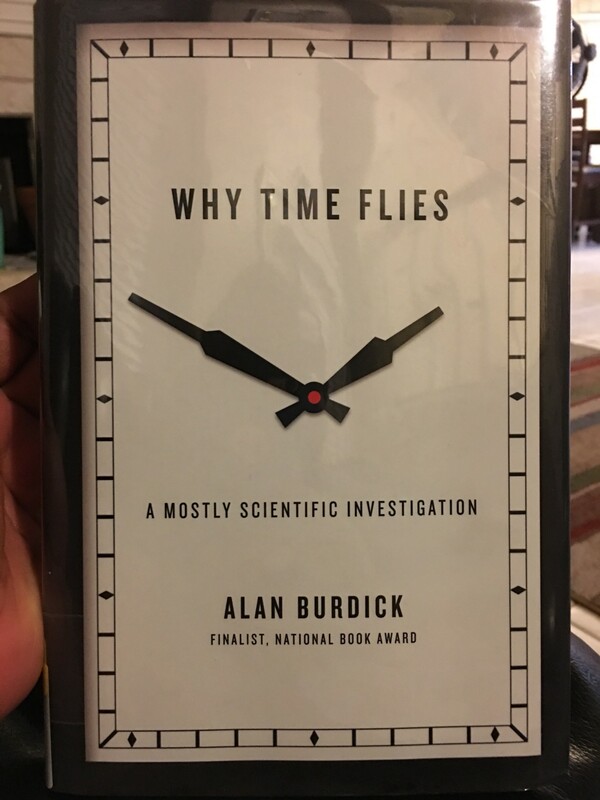 I read a WSJ review of a book on time — Why Time Flies, by Alan Burdick. The review promised that Alan Burdick has answered the questions I had on time and more. That caught my interest and I reserved the book from Austin Public Library ahead of the release. And APL had it for me just days after the release. Physicist Richard Feynman says “What really matters anyway is not how we define time, but how we measure it.” And Alan takes us through an interesting journey on time to prove that by talking about time from the smallest measure to the largest. Did you know that scientists have succeeded in calculating time to an attosecond (10−18 second)? Do we have one clock inside us that regulates what we do or do we have millions of them? Is a lump of coal a clock? Does time tick faster as you grow older? Why do we feel time stood still when we are doing something unpleasant and feel time flies when we are enjoying what we do. But beware, the book is not a breezy read. Alan Burdick is no Bill Bryson. Despite some lighter sections, the book is mostly serious and scientific as the author promises. But if you do persist, you get to understand Time and may be you can even claim part of the ‘Timing Mafia’ as one of the scientists quoted in the book says. Should I say, time well spent! In an earlier post on Carnatic music, I had bemoaned the fact that there is very little other than Bhakthi that is sung and there is no representation of contemporary issues in it at all. During December season, I did hear Sanjay coming up with some apt songs on Demonetization. TMK, who has written a lot about social imbalance, has come up with a song on Poramboke lands. He has come out with a song generally on this topic, with a specific aim to save the Ennore Creek near Chennai. The video of the song was released on Pongal day amidst much fanfare. Having listened to this a few times, I cannot but be in awe of the talent of R.K.Shriramkumar who has set these lyrics to tune and the capability of TMK in delivering any lyric in a mesmerizing way. But did I like this song? I have to sadly say No. The reason is two fold. First, the lyrics lack a certain poetic grace, that to me is important when it is going to be performed as a song and that too in a rathered nuanced form of music such Carnatic music. It is difficult to explain this in words but it is a flow of the words that produce a lilting musical feeling that is absent here. Because Shriram and Krishna weaved their magic, this song is sounding the way it is. It is a novel effort to use colloquial Tamil usage and a mix of English and Tamil words in the lyrics as that is how most of the state speaks today. But words like கத்துட்டது (kaththuttadhu) or concrete dont gel into the tune and are very jarring. Lyrics do play an important part in Carnatic music and it was not up to the standard. This is not a song I will go back to and listen again and again, as I do with a lot of other songs sung by TMK. I understand this is a very personal opinion and everyone need not feel the same. The second point is on the messaging. Is it a song about how common property is misused and abused? Isn’t that what the title of the program suggests? While the lyrics did start that way, references to the policies of the current government did dilute the message. Does this exonerate the earlier governments? Why pick on only this government? That in my opinion changed the social agenda of the song, into a political agenda. And this would alienate a section of people who would have otherwise supported the cause. I will support a social agenda but would think twice before I make my political leanings public. Having said that, I welcome wholeheartedly the effort to introduce contemporary issues using Carnatic music as a medium. Music has been used as a tool to bring causes to the knowledge of public and it is important that Carnatic music plays its role that way as well. Kudos to the team for the effort. During the release of the video, a concert was held and my dear friend and a disciple of TMK, Vignesh Ishwar had performed there. He had requested me to pen a few lines on the same topic that he wanted to sing in viruttam style. He had done a fabulous job of tuning my lines and singing them in a concert. It was a great pleasure to listen to this rendering especially when it was followed by a song of Mahakavi Bharathi, the matchless Tamil poet. It made my Pongal great! Thanks Vignesh for the opportunity.